We all face challenges in today’s complex, competitive, and busy world. Problems sometimes seem overwhelming. Avoidance of negativity often requires a healthy balance between living in the now and planning for an uncertain, but hopeful future. 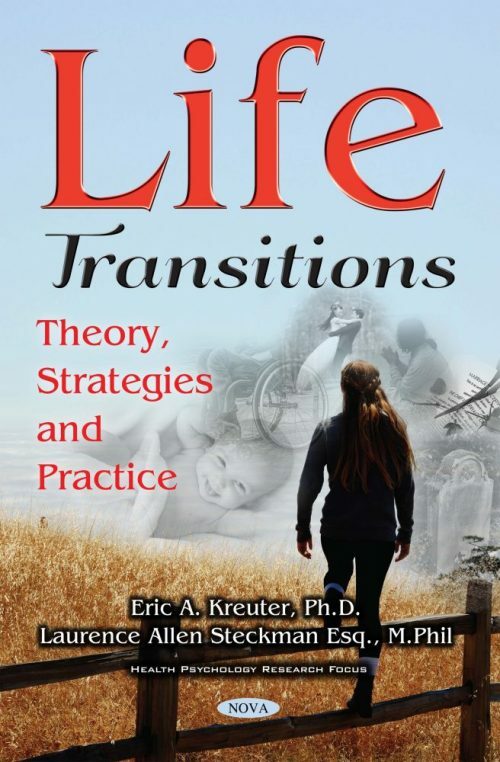 The authors refer to “turning points” or “life transitions,” events which can be either wonderful and invigorating or anxiety-inducing and daunting. Turning points, even minor ones, may increase a sense of life’s meaning or they can have the opposite effect. Turning points might include, for example, the birth or death of children or grandchildren, the relocation of close relatives or friends, serious and disabling accidents, diseases or impairments, sudden and unexpected loss of employment, and environmental disasters that result in loss of property, stability or health. They might include the death of a loved one, for example, a spouse, life partner or companion, or being victimized criminally, by theft or fraud, or being assaulted, with continuing physical or emotional consequences. Turning points could include being required to undertake caretaking responsibilities for a spouse or parents, retirement and the question of how one should profitably spend one’s time. Presentation of a new career opportunity, where life skill and experience is coveted, could involve a positive transition. Negative events can dramatically alter a life’s trajectory, resulting in major shifts in outlook, mood or motivation. These may, in turn, cause a downward spiral, particularly if the aftermath is severe. On the other hand, turning points may stimulate a life in positive ways. As our society ages, many of us have become (or will become) part-time or even full-time caretakers of our parents. Such responsibilities can prevent or delay a desired relocation or cause us to reconfigure a home to accommodate an older relative’s physical needs. This book provides tools for therapists and coaches in the business of helping people with their difficulties. It is also for people who happen to be engaged in their own efforts to address life’s circumstances with openness and a desire to find new ways of confronting problems. Rather than simply calling this method “self-help,” we can look at it as a willing entrée into the exciting world of change with all of its possibilities. Through the authors’ personal experiences, lives of anxiety and fear can often be steered to calmer waters, avoiding or lessening the turbulence of life events. Resilience can be enhanced, lessening the severity of a past trauma’s effects. Realistic improvement is possible for those willing to seek its possibilities. The authors, writing from somewhat different ends of the personal belief spectrum (one a devout Catholic and the other an acknowledged non-believer), present this volume for readers to interpret rather than to promote a common position with respect to a particular theological or philosophical position regarding religion, faith, or God. Allport, G.W. (1968). Personality & social encounter. Boston: Beacon Press. Allport, G.W. (1983). Becoming: Basic considerations for a psychology of personality. New Haven, CT: Yale University Press. Anderson, A. R. (2013). Admitting you were wrong doesn’t make you weak – it makes you awesome! Forbes. Retrieved August 24, 2014: http://www.forbes.com/sites/amyanderson/2013/05/01/admitting-you-were-wrong-make-you-weak-it-makes-you-awesome/. Bartol, C. R. (2008). Resilience and antisocial behavior. In C.R. Bartol & A. M. Bartol, Current perspectives in forensic psychology and criminal behavior, Second Ed., (pp. 81-95). Los Angeles: Sage. Buber, M. (1949). The prophetic faith. Princeton, NJ: Princeton University Press. Burke, M. (2014). Personal communication. April 19, 2014. Covey, S.R. (2004). The 7 Habits of Highly Effective People, Pub. New York, Simon & Schuster. DiBartolo, C. (2017). Personal communication. January 2017. Dougherty, G.S. (1924). The criminal as a human being. New York: D. Appleton and Company. Eliot, T. S. (1968 ed. ), Four Quartets, Little Gidding, The Folio Society, London. MCMLXVIII, printed W & J Mackay Limitted, Chatham). Ferrante, L. (2009). Unlocked: The life and crimes of a mafia insider. New York: Harper. Ferrante, L. (2014). Website. Retrieved May 31, 2015: http://www. Fisher, A. (2014). Stages of development: Aging across the life span. Social work helper. Date retrieved: December 14, 2016: https://www. Frankl, V. (1998). The will to meaning: Foundations and Applications of Logotherapy. New York: Plume. Fromm, E. (1969/1941). Escape from freedom. New York: Henry Holt and Company. (Originally published in 1941). Galbraith, S. (2013). CEO series: Cynthia DiBartolo – A tigress in a shark tank. Forbes, August 12, 2013. Date retrieved: January 20, 2017: http://www.forbes.com/sites/sashagalbraith/2013/08/12/ceo-series-cynthia-dibartolo-a -tigress-in-a-shark-tank/#1e350b9a5ea0. Ghougassian, J.P. (1972). Gorden W. Allport’s ontopsychology of the person. New York: Philosophical Library. Goulding, M.M., & Goulding, R.L. (1997). Changing lives through redecision therapy. New York: Grove Press. 14, 2015: https://graceandgritforlivinglife.wordpress.com/2012/11/14/ sensitivity-vs-callousness/ retrieved 1/4/15. Heidegger, M. (1993/1977). Basic Writings. D. F. Krell, (Ed.). San Francisco: Harper Collins. Jaspers, K. (1995/1971). Philosophy of existence. R.F. Grabay, trans. Philadelphia: University of Pennsylvania Press. Kaufman, P. (2012). The unapologetic society. In Everyday Sociology Blog, March 1, 2012). Retrieved August 22, 2014: http://www. Kreuter, E. A. (2003). Love’s journey: A book of reflections. 1st Books Library: New York. Kreuter, E.A. (2006). Victim vulnerability: An existential-humanistic interpretation of a single case study. Hauppauge, NY: Nova Science Publishers. Kreuter, E.A. (2007). Inside the psychopathic mind: A forensic interpretation based on dialogue with the victim cohort. Advances in psychology research, vol. 48, (pp. 279-292). Hauppauge, NY: Nova Science Publishers. Kreuter, E.A. (2010). Cyber psycho. In J. Wells (Ed. ), Internet fraud casebook, (pp. 349-358). New York: Wiley. Kreuter, E.A. (2011).Victimization analyzed through the voices of a predator: Expansion of a single case study. Hauppauge, NY: Nova Science Publishers. Kreuter, E.A. (2012a). Victimization analyzed through the voices of a psychopathic predator: Expansion of a single case study. Hauppauge, NY: Nova Science Publishers. Kreuter, E.A. (2012b). Research into the voices of the psychopathic predator: An analytical case study. International journal of psychology research (7) 2. Kreuter, E.A. (2013). Fostering resilience for loss and irrelevance. New York, NY: Springer- Verlag. Kreuter, E.A. (2016). Chasing rainbows: An existential perspective of a marathon runner. Hauppauge, NY: Nova Science Publishers. Kreuter, E.A., & Moltner, K.M. (2014). Treatment and management of maladaptive schemas. Springer, Switzerland. Laing, R.D. (1990/1959). The divided self. London: Penguin Books. Originally published in 1959. Lauch, P. (2013). Personal communication. January 13. Macquarrie, J. (1973). Existentialism. Harmondsworth, Middlesex, England: Penguin Books. May, C. (2013). The advantages of not saying you are sorry. Scientific American. Retrieved August 22, 2014: http://www.scientific American.com/article/advantages-of-not-saying -you-are-sorry/Visual perception theory. Simply Psychology (2016). Date retrieved: July 24, 2016: http://www. Merleau-Ponty, M. (2004/1962). Phenomenology of perception. C. Smith, trans.). London: Routledge. Originally published in 1962). Nietzsche, Friedrich, (2016). The Gay Science, Section 283. Retrieved October 5, 2016, LeXido, the Full and Free Nietzsche Portal (Originally published 1882).http://www.lexido.com/EBOOK_TEXTS/ THE_GAY_SCIENCE_FOURTH_BOOK_.aspx?S=283. Piaget, J. (1950). The psychology of intelligence. M. Piercy and D.E. Berylne, trans.). New York: Harcourt, Brace & Company. (Originally published in France 1947). Prinz, J. (2014). Morality is a cultural conditioned response. Philosophy Now, Retrieved September 3, 2014: https://philosophynow.org/issues/ 82/Morality_is_a_Culturally_Conditioned_Response. Reich, W. (1974/1925). Der Tribhafte Charakter, B. Koopman, trans. As The impulsive character and other essays. New York: New American Library. Originally published in 1925). Roff, M. (1970). Childhood social interactions and young adult bad conduct. In. G.R. Medinnus and R. C. Johnson, Child & adolescent psychology: A book of readings, pp. 375-384. New York: John Wiley & Sons. Rogers, C. (1961). A Philosophy of Persons, A Therapist’s View of the Good Life. Ruggiero, V. R. (2014). Learning from our mistakes. Catholic Journals US, January 16, 2014. Retrieved August 24, 2014: http://www.catholic journal.us/2014/01/16/learning-mistakes/. Russell, S. (2012). Why can’t law enforcement admit they blow it sometimes? Pacific Standard. Retrieved August 22, 2014: http://www. Sartre, J. (1960). The transcendence of the ego: An existential theory of consciousness. R, Kirkpatrick & F. Williams, Trans.. New York: Hill and Wang. Originally published as La Transcendance de L’Ego: Esquisse d’une description phenomenlogigue, 1936-37. Seligman, M.E.P., Linley, P.A., & Joseph, S. (2004). Positive psychology in practice. Hoboken, NJ: Wiley. Stanton, M. (1991). Sandor Ferenczi: Reconsidering active intervention. Northvale, NJ: Jason Aronson. Steckman, L.A. (2013). Afterword. In E.A. Kreuter, Fostering resilience for loss and irrelevance. New York: Springer. Steckman, L.A. (2014). Foreword. In E.A. Kreuter & K.M. Moltner, Treatment and management of maladaptive schemas. New York: Springer. St. James, E. (1994). Simplify your life: 100 ways to slow down and enjoy the things that really matter. New York: Hyperion. your missteps. Psych Central Blog. Retrieved September 2, 2014: http://psychcentral.com/blog/archives/2013/12/26/rethinking-mistakes-learning-from -your-missteps/. Taylor, E. (2009). The mystery of personality: A history of psychodynamic theories. London: Springer. Tillich, P. (1980). The courage to be. New Haven, CT: Yale University Press. Williams, M., & Penman, D. (2011). Mindfulness: An eight-week plan for finding peace in a frantic world. New York: Rodale. Wollman, B. B. (1999). Antisocial behavior: Personality disorders from hostility to homicide. Amherst, NY: Prometheus Books. Wormith, J.S.. Althouse, R., Simpson, M., Reitzel, L., Fagan, T. J., & Morgan, R.D. (2008). The rehabilitation and reintegration of offenders: The current landscape and some future directions for correctional psychology. In Bartol, C.R. and Bartol, A.M., Current perspectives in forensic psychology and criminal behavior, 2nd Ed., (pp. 251-259). Los Angeles: Sage.